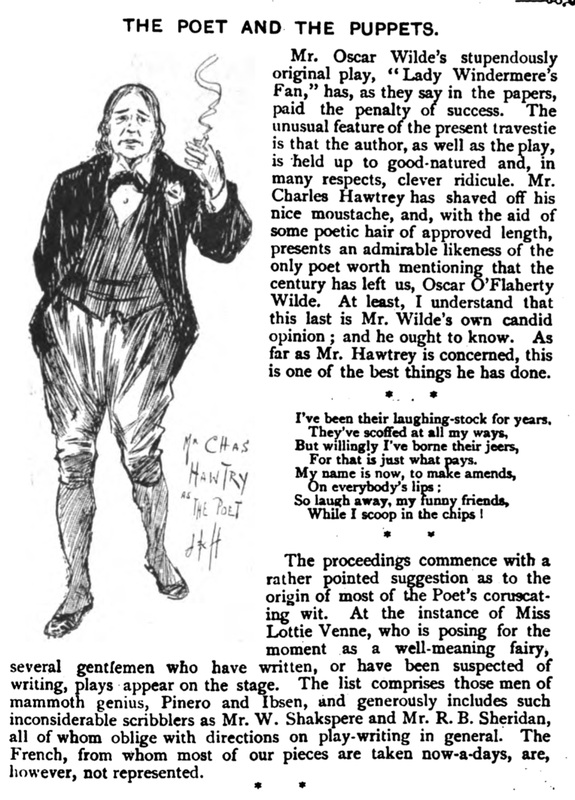 The ‘Fancy Portrait’ of Wilde appeared in Punch; or, The London Charivari on March 5, 1892. 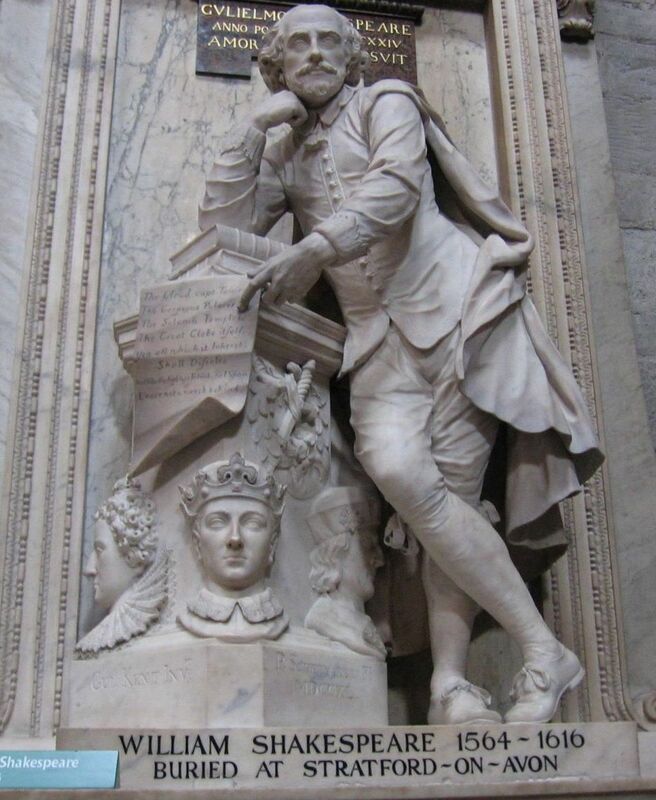 It was the work of staff illustrator Bernard Partridge  who took his inspiration from the monument to that former great, William Shakespeare by Peter Scheemakers in Poets’ Corner of Westminster Abbey (above). The caption refers to Oscar, facetiously, as “the new dramatic author“. So we are invited to compare Shakespeare, elevated by a stack of his inspirational works, with Wilde, literally leaning on the influence of French literature. The fan bearing the name of Wilde’s play substitutes for Shakespeare’s manuscript, and Will’s bust has been deposed to the erstwhile level of mere monarchs. The Punch line is our point of departure. It hypothesizes Wilde as the heir to the English-speaking stage by renaming him: Oscar Shakespeare Sheridan Puff, Esq. From this hybrid name we see that Wilde is not only supplanting Shakespeare as the new titan of the theatre, he is also taking over the mantle of his fellow Dublin-born antecedent in the comedy of manners, Richard Brinsley Sheridan. Therefore, also at Wilde’s feet behind an open box of unpuffed cigarettes, is a discarded copy of Sheridan’s comedies. The Sheridan connection is what bring all this puffing together. 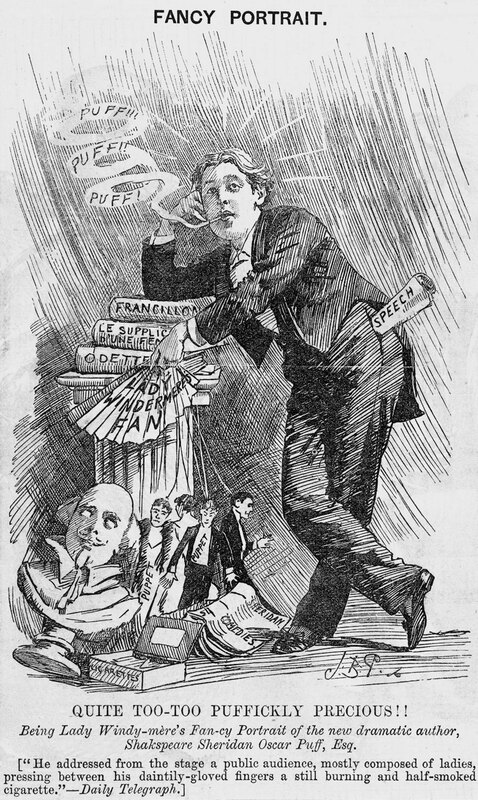 Much is made in the cartoon of the word Puff: it appears three times in the wreaths of smoke; it masquerades Puffickly in the title; and it completes Wilde’s new name as Sheridan Puff in the caption. Further parallels of the proto-Wilde can be seen with the entrance of the play’s protagonist, Mr. Puff, a theatre man who introduces himself as being “at your service—or anybody else’s”. Such is Puff’s enthusiasm for the stage that he is far too busy writing positive reviews that he has no time to actually see the plays. But, Mr Puff is a promoter with a yen to write, and as a transducer of other authors, he lays the Wildean groundwork by surviving on deceit “until one has made a tidy sum”. We find in the foppish Fretful—a dramatist who never means what he says, and would rather be ridiculed than ignored. A man who has a complex relationship with the press, and thinks that newspapers are an abomination, “not that I ever read them,” he protests. This is all quite Wildean, and in one exchange Sneer and Dangle pretend to be serious about press criticisms of Sir Fretful knowing them to be made up; while Sir Fretful, aghast at thinking them real, pretends to take them trivially. The Sheridan allusion to fraught relations with the press proved to be prescient, and the cartoon also reflects the significant interaction Wilde had with the Daily Telegraph about Lady Windermere’s Fan. In the above close-up, at Wilde’s feet, we see four characters that Oscar is controlling with strings. These are the actors in his play, and the emphasis of the word Puppet emblazoned on them is quite deliberate. 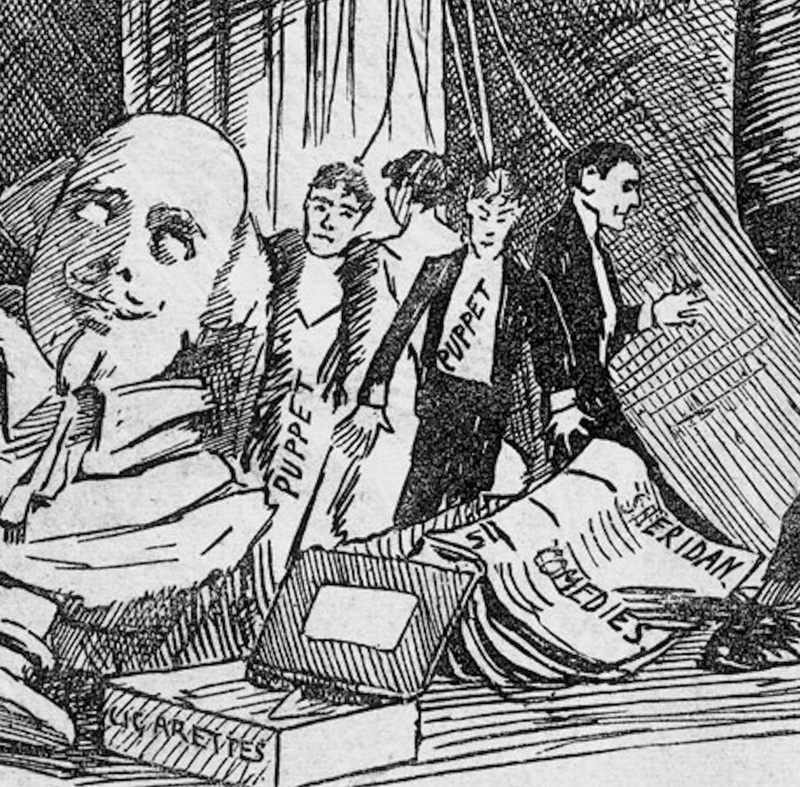 The story briefly is that less than two weeks before the debut of Lady Windermere’s Fan and this subsequent cartoon, Wilde chaired a meeting in London of the Playgoers’ Club. Based only hearsay, the Telegraph misquoted Wilde as having said that actors were like puppets. Wilde in return wrote at length to the paper a few days later (in fact on the same day that the play opened) to clarify his comments and place them into the proper context. The Telegraph published Wilde’s letter on February 20 under the heading ‘Puppets and Actors’. (Letters, 518). In the letter Wilde also took the opportunity, perhaps self-consciously, to downplay his connection with John Gray who had also spoken at the meeting. Brookfield’s play as a travesty of Lady Windermere’s Fan is a polished mirror that reflects the furore surrounding Wilde at the time and, as such, is well worth revisiting. Wilde expert and collector, Michael Seeney, is currently preparing for publication the first full edition of The Poet and the Puppets with biographical and contextual material, to be released later this year. Excerpt from a review in the journal Pick-Me-Up, July 2, 1892. The Poet and the Puppets is also, in part, an incarnation of the themes in the cartoon. Its characters include Wilde, Sheridan and Shakespeare, and one lyric from the play leaves no doubt about their relative positions. The suggestion is that since Wilde’s arrival Napoleon Bonaparte would, in deference to his famous definition, now describe England as a nation of play-stealers. A poet with a Mind! And hair too long behind. And tell the public so. Which brings us to what, precisely, did Wilde tell the public on that famous night? Replicating the shape of Shakespeare’s cloak in the cartoon is Wilde’s speech in his pocket. The inference is that his oration was prepared—but this almost certainly was not the case. Wilde reluctantly did not expect to be recalled that night, so his words probably came to him spontaneously, and thus reinforce something innate: his persona as the ingenuous provocateur intent upon breaking the rules. Oscar’s presumptuous pose perhaps explains why people took exception to what he said, and it was likely a similar impulse, emanating from somewhere between nervousness and egotism, that got him into trouble in court three years later. For what he actually said we have to rely on reportage. The preciseness of this excerpt gives a sense of its being verbatim, and if so, it was probably taken down shorthand. Certainly the phraseology rings true of Wilde. His friend Louise Jopling, who attended the first night, recorded Wilde’s speech in her memoir Twenty Years of My Life (John Lane, 1925, pp. 78-82) and she tends to bear out this report, as well as defending Wilde’s nervousness in smoking. 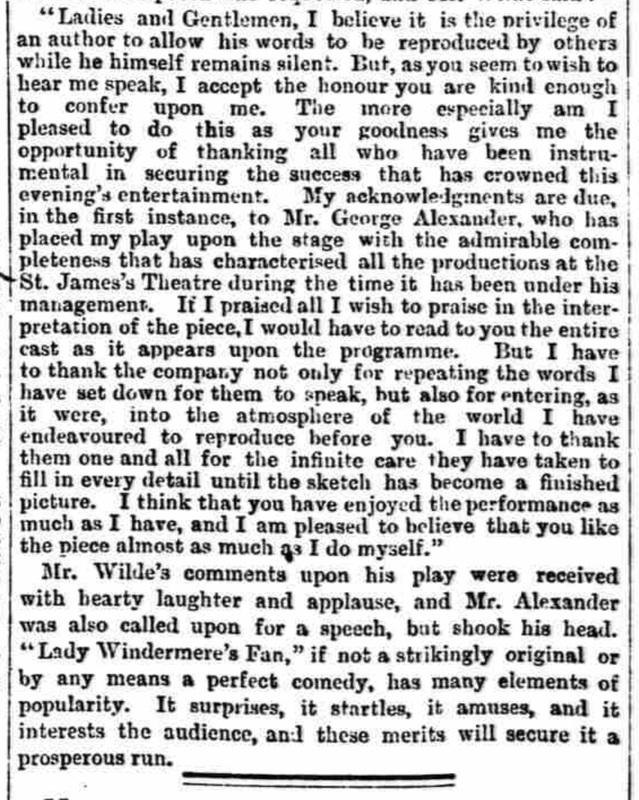 In his speech Wilde graciously credited George Alexander, who, as producer, would have good reason to be interested in what Wilde said. So let us turn to him next. It has become a classic Wildean moment, the keynote no doubt being Wilde’s word almost. This version is the one that has come down us to us via many biographies, including Ellmann. And it has also been enunciated by actors, cigarette in hand, more than once in filmed versions of the Wilde story—with varying degrees of disappointment. The cartoon and skit of Wilde caused much amusement in 1892, but Oscar has had the last laugh. In 1995 he joined Shakespeare and Sheridan by being recognized himself in Poets Corner of Westminster Abbey, while few today treasure the memory of the cartoonist Partridge and the actor Brookfield who belittled Wilde’s place within the legacy of the theatre. “Mr. Oscar Wilde Explained.”, St. James’s Gazette, February 29, 1892, 6. Belfast News-Letter, February 22, 1892, 5. Sir John Bernard Partridge, 1861—1945. See National Portrait Gallery. Daily Telegraph & Courier, February 12, 1892, 2. The Morning Post, February 22, 1892, 2. Most interesting. I for one appreciated Peter Finch’s 1960 reading. His delivery of lines offered the vocal timbre that best captured Oscar’s comedic ego. Thanks again. Good observation. I too, liked Finch, not just in this speech but overall. Proving, I suppose, an actor in a biographical role need not necessarily resemble the character in looks or lifestyle. Fry was much better in an earlier TV appearance as Oscar, but not quite a good as Peter Egan and Michael Gambon. Very interesting to read this – thank you. I also found Peter Finch the best of the three – he delivered it in the closest way to how I personally imagine Wilde intended it. Fry’s version was too fast and sounded as if he was playing himself. That is one of my criticism of Fry’s performance. We shall see how Rupert Everett does it soon in The Happy Prince. I am grateful also to Dr Michèle Mendelssohn in her new book “Making Oscar Wilde” for pointing out the similarity between Wilde’s speech and that of the poet in Aristophanes’ “The Clouds” who addresses the audience to aver that he shall never willingly cease to seek the approval of the discerning. Or words to that effect depending upon the translation.